Nadege Iradukunda, an 18 year-old Rwandan, is helping schools in her country to significantly reduce their operation cost by providing them bio-digester plants that use natural biological process to transform food waste in energy. She realized that, since, in Rwanda, schools spent their budgets on firewood for cooking meals, bringing a sustainable solution to this issue could help bring the fees down and allow more students to afford school. At the same time, she was concerned about the fact that the use of wood stoves contributed to deforestation and soil erosion and caused respiratory diseases among kitchen workers. In developing her idea, she was inspired by Rwandan prisons’ use of biogas instead of wood for cooking, which saves them 40 percent in energy costs. In order to determine schools to adopt biogas energy, the young Rwandan joined the United Youth for Rwandan Development (UYRD), a youth led non-profit NGO aiming to ensure sustainable health and livelihood services to underprivileged and marginalized young people through education and advocacy. The young Rwandan’s project, called the Biogas Digester Plants (BDP), has already provided 15 bio-digester plants, since its creation, serving more than 15,000 students, while also inspiring other schools to reduce their operating costs. Nadege aims to soon be able to offer bio-digester plants to all schools in Rwanda. In 2012, the young Rwandan was selected among the 13 finalists of the Anzisha Prize, created by the African Leadership Academy alongside the MasterCard Foundation. The prize celebrates the innovation and entrepreneurship of African youth aged 15-20, who have developed innovative solutions to tackle their communities’ problems. In encouraging Rwandan youth to take action, Nadege stressed: “I want the Rwandan youth to know that they can make a difference and contribute to the country’s development. 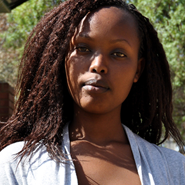 They don’t have to wait to complete university studies in order to start working; they have to start working when they are young.” She believes that youth-led development is particularly required in Rwanda, where over 70 percent of the population is young.